State-linked developer Emaar Properties and Dubai Holding will build a new mall, similar in size to Dubai Mall at around 750,000 square metres, at their flagship project Dubai Creek Harbour. Dubai Square, as the developer has named the project, will also have around 1,500 hotel rooms and thousands more apartment units. The project is expected to cost Dh10 billion, according to Mohammad Alabbar, chairman and CEO of Emaar Properties, speaking to members of the press. Half of this will be funded by debt, he added. The mall, which will feature streets, plazas, and a glass roof, will give off the impression of an indoor city, according to Alabbar. With industrial themed sections, traditional Arabic architecture in other parts, and the previously announced Chinese city within the mall, the shopping centre will act as a key feature of the Dubai Creek Harbour development. Alabbar has said that he is eyeing up the 75 million transiting passengers through Dubai International, making a play for five or six million of those to visit the shopping complex. Grand Central Station, as it will be called, is expected to receive passengers direct from the airport to Dubai Square, via a free of charge metrolink. This will allow transiting tourists to spend their layover at the mall. “If we can just get those through, that’ll be very big for us,” Alabbar said. The larger Dubai Creek Harbour development will have three metro stations linking to the wider RTA network. A coming together of all of Alabbar’s business interests, including Americana, Aramex, and Noon, the billionaire businessman announced the launch of Dubai OS, providing all of Emaar’s retail tenants with a ready-made e-Commerce platform. Selling through e-Commerce site Noon, via a logistics network provided by Aramex, all of Emaar’s retail clients will now be able to sell and ship throughout the region. 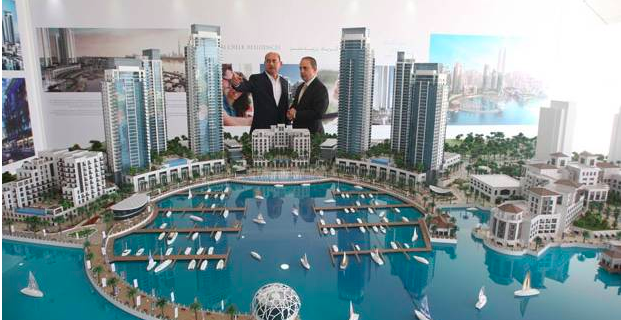 In total, Emaar says it has 28 total projects underway at the Dubai Creek Harbour development. Over 8,500 apartments will accommodate the city’s more than 200,000 residents. Dubai Creek Tower, expected to be the tallest building in the world upon completion, will welcome seven million visitors every year, Emaar claim. Underneath the tower will be a concert venue capable of hosting 30,000 people, the company adds. The first phase of the project, an island, will be open in the fourth quarter of 2018.